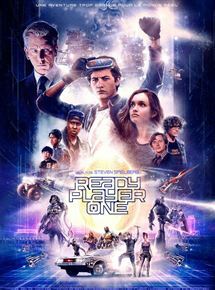 A pretty good movie for about three quarters of the way through, packed with cool action and references, it’s only in the last act that things start to get tiresome and flawed. There’s definitely some good stuff here, and a lot of it. The virtual reality world and concept about how the real world has kind of fallen apart and everybody goes into virtual reality to escape is pretty neat. And then there’s the quest by the man who created the program, which is a series of riddles that characters need to solve as they go on a search for “Easter eggs,” or keys. Even two of the three riddles are cool. But somewhere in the second half, this becomes very much about good guys vs. bad guys and a war between the two. That’s where it goes off the rails, and just become a sort of chaotic mess. Luckily, though, this is only in the final portions of the film. Most of the way through what we are given is a pretty lively and creative experience. 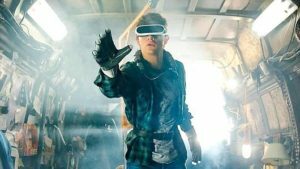 Ready Player One is a movie based on some very cool concepts. It all comes from a book written by Ernest Cline about a world that has gone to hell, where people live in trailers packed on top of trailers, to the point where these giant stacks of them are piled up high like skyscrapers, (only really more like landfills.) To escape all of this, people go into a virtual reality world, where they generally spend all of their time. That world is called the Oasis. The movie opens with the voice over narration of Wade Watts (Tye Sheridan.) He explains how the only things people need to leave the Oasis for are to eat, sleep, and use the bathroom. It’s practical and logistical ways of thinking about things like this which really drive the first portions of the film. Another example is the 360 degree treadmill that people walk in while playing the game. This way they can move in all directions and are always moving when they are walking. But considering how much of the game takes place in vehicles, like cars, or motorcycles, you would think the treadmill would come with a seat next to it, to sit in when simulating driving one of those vehicles, (think of arcade driving games, and how they almost always come with a seat, to really feel like you are a driver.) Still, there’s so much to like about the concepts here that finding faults with the first parts of the film is just nit-picking. We learn about how money is spent and lost and gained in this virtual world (kind of like how in today’s society, you can buy a character costume in real life and then your character wears that costume in the game.) At one point we hear about how the Oasis can make or break you, if you lose all the “coin” you’ve spent years collecting. We even watch as an Asian businessman dies in a game, throws off his goggles, and tries to commit suicide, running at a window. And once all of this has been established, fairly on, we hear about the challenge. The mission. There was a guy named James Halliday (Speilberg’s recent golden boy Mark Rylance,) who invented the Oasis. And he has since passed away, but he left 3 clues or Easter Eggs as this movie calls them, (kind of a shameless attempt at grabbing the attention of youth culture, when really it’s more like riddles that he left, which need to be solved.) The challenge is that whoever can solve all three of them (or whoever gets the most points from solving them,) will get control and ownership of the whole Oasis. It sounds a little like Willy Wonka and the Chocolate Factory, where whoever made it through the factory tour would become the new owner of the factory. So everyone is out to solve the puzzles and the riddles and win the game. For each riddle you solve, you are granted a different color key. The whole thing sounds kind of like a video game. Especially when you consider what the first challenge is, a giant race through all kinds of city streets and obstacles. It makes for an amazing action scene, (all computerized of course,) but still a lot of fun, with giant things popping out and attacking the vehicles that are flying around and crashing into each other left and right. At the end of the race, King Kong shows up and grabs whatever cars are left, that are heading to the finish line. Wade meets a famous gamer during the race, who he has been reading the blog of. This is Artemis. Wade’s game persona is a character called Parzival. He and Artemis go to Parzival’s friend, Aech’s place. Aech is a giant ogre in the video game (the Oasis.) He may be Wade’s best friend, but Wade has never actually seen Aech in real life. He only knows what Aech’s avatar character looks like. That element of the movie is pretty cool. While many elements of this story feel familiar (the way the world in the future has gone to hell, and people jump inside a fake world game to escape it, feels very much like The Matrix,) one that is kind of unique is the way that these characters look completely different than their avatars. That concept turns out to be a lot of fun. With the first challenge (the race,) the way that Parzival figures out the clue is pretty cool. He goes into the archives and does research about Halliday and something he watches (another cool idea here is that you can actually watch someone’s memories,) reveals something to him. He understand exactly how Parzival figures it out, and the trick to solving the riddle turns out to be really creative. It’s right out of something like Super Mario Brothers, running on top of the board instead of playing in it, when you think about it. The second challenge is nearly as awesome. This one takes the characters into the Overlook Hotel from the Shining. We go from room to room and get tons of references to the movie, from the woman in the shower in room 237, to the twin girls in the hallway, to the elevator that floods with blood. At one point we even go out to the hedge maze at night. At another, we got into the lobby to look at what Jack *(the Jack Nicolson character,) has been typing. It would have been nice to meet one or two of the other characters from the movie, such as the bartender in the ballroom, but as far as scenery and parts of the hotel, they sure do show us a lot. And it’s all fantastic. The only thing not great about that scene is the actual riddle and how it was solved. There’s a ballroom dance scene number with characters basically dancing in mid-air, and the next thing you know, the riddle has been solved. It’s not nearly as clear as the first riddle about the race track. And yet it blows away the third one, which is a total mess. So while the Shining reference are pretty creative, the riddle itself isn’t given the kind of time or clarity that it needs, and this is where the movie first shows signs of wearing itself out. But aside from solving the riddles, Parzival and Artemis and Aech also have another challenge. There’s a villain who’s out to get them. his name is Nolan Sorrento, and he used to be partner with Halliday. Sorento has been trying to gain control of the Oasis, ever since Halliday died. Now he runs a huge company (the bad guy is always the head of a giant corporation, filled with dispensable henchmen for our heroes to take out. It’s why the hero is always the rebel and the villain is always the corrupt company, fighting the underdog. The man playing this villain here, Nolan Sorrento, is Ben Mendelsohn (the breakout star of the Netflix show Bloodline,) and he’s a great, scary actor when he’s not trying so hard. He played that part perfectly in Bloodline. Here, like in StarWars, Rogue One (where he also played a villain,) he’s not nearly as menacing as he should be. Between offering Parzival a job and being dumb enough to leave his password written down on a scrap of paper resting in his chair, where anyone can find it, this guy is not as smart as we’re supposed to think he is. Nolan does do something pretty terrible though. he has his drones blow up the area where Parzival’s aunt and her boyfriend live, hoping Parzival will be there too. Other than that though, he’s not really that menacing or evil. And the movie goes to great pains to stop him at the end, getting into a giant war in order to do so. That war is packed with references to characters from other times, including ones from Mortal Ko’s all. mbat and Streetfighter. But for every reference there is, there’s also a ton that’s missing. There’s no references to He-Man, Thunder Cats, The Lord of the Rings, or even Speilberg’s own Jurassic Park. Just a T Rex, that’s all. But at point it feels like there should be more. For example, there’s a perfect opportunity for Spielberrg to reference the famous Samuel L Jackson Jurassic World line, “Hold onto your butts,” and instead he has a character just say “Hold onto something.) It’s this kind of loss of focus that plagues that final portion of the movie. Still, most off the film was both creative and exciting, and it was definitely a lot of fun.